This is a very famous question that many already are aware of. But I wanted to give a comprehensive working program in java to implement this with illustration. 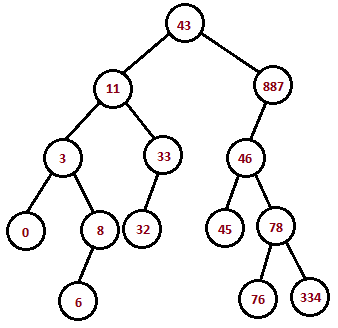 Consider the following binary tree which infact is a binary search tree. The idea is very simple. For the first node traverse up till you reach root, while doing so, put the nodes in a hash set. Then do the same for the second node ie, try to traverse towards the root. Amidst doing that search for the existence of this node in the hash set we already created for the first traversal. The place where those two nodes matches will be the common node. For any two nodes in a tree, there will be at least one common node which will be the root. I have given two examples below. One having a node other than root as the common parent and the other with root as the common parent. The green line shows the traversal of first node path. Red shows the second node's path. The intersection or the common parent is shown in a blue circle. Now for the Java source. The implementations for Tree and BinarySearchTree can be found here. this solution actually has problems. If the nodes have only the left and right pointers rather than the ancestor pointer the solution tends to fail. Because in that case a bottom up manner will not work, since the pointers can only show the nodes which are left of the current and right of the current one. @Mavi: What you say is correct. As a matter of fact, I have an implementation for this problem without having an ancestor node. 1. If the parent node link is given, we can trace each node back to the root. The problem is to check where those two links merge. 2. If it is a binary search tree (BST), we needs to find the node whose branch covers both nodes. Each node in BST has a min and a max that covers some certain range.